An important chapter in the history and of the West is how women on the cattle frontier took their place as equal partners with men. The cowboy may be our most authentic folk hero, but the cowgirl is right on his heels. While Susan B. Anthony and her hoop-skirted friends were declaring that females too were created equal, Sally Skull was already riding and roping and marking cattle with her Circle S brand on the frontier of Texas. In Colorado, Cassie Redwine rounded up her cowboys and ambushed a group of desperadoes. In Montana, Susan Haughian took on the United States government in a dispute over some grazing rights, and the government got the short end of the stick. Susan McSween carried on an armed dispute between ranchers in New Mexico and the U.S. Army. In Arizona, Annette Taylor experimented with new grasses and found cures for the diseases that plagued her stock. From ranches to Wild West show and rodeo; from dime novels and fiction to song, joke, tall tales and the movies; from the frontier to the footlights-that's what The Cowgirls is all about! "Cowboys have always had more attention than their female counterparts, but in fact the Old West never was, nor is today, totally a man's world. Joyce Roach is the ideal writer to set the record straight." As a college student back in the early 1990s, I stumbled over The Cowgirls in a small and newly formed section of the college bookstore called "Women's Studies". Having only a vague inkling about rodeo history and women's part in it, I stood spellbound as I thumbed through this book, completely absorbed for who knows how long. It was one of those moments, shall I say, when the written word washes through ones consciousness and resonates in a way that cannot be explained. I was changed, for a part of me had been validated. 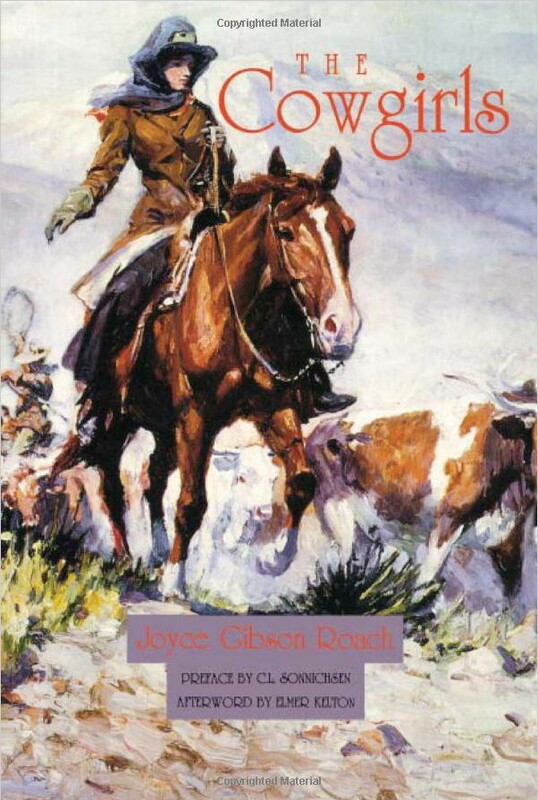 Growing up in a rodeo town through the 50s and 60s, my perception of women in rodeo was quite different from the stories of those who Joyce Gibson Roach documented in this precious and groundbreaking work. At the time of publication, the book was at the forefront of a resurgence in interest in women's history. In my opinion, it is still the only definitive history of the pioneer rodeo cowgirl. The book is written in colorful language I can only describe as rustic elegance and profound wit. No wonder it's still in print. Joyce became my hero as a researcher and writer of first rate, and the stories she told still inspire me three decades later. I bought many copies of this book and gave them to jaw-dropping friends who had "no idea" about this particular slice of women's history. Thank you Joyce. Thank you for all that you gave back to us.